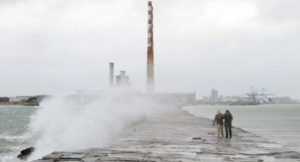 Ireland could be hit by a strong Atlantic storm later this week with winds of up to 150 kilometres an hour. Met Éireann says there is the potential for a named storm coming close to Ireland on Thursday night and into Friday morning – and it would be called Callum. A yellow rainfall warning for Donegal, Mayo and Sligo is currently in place with 25 to 40 millimetres of rain expected to fall. “There’s a lot of uncertainty in it but on Friday morning, it looks like a storm on the Atlantic is going to bring a lot of windy weather over,” he said. Meanwhile, it will be largely dry today for most except Ulster and north-west Connacht, where there will be rain that could be heavy at times. Elsewhere there will be sunny spells and variable amounts of cloud, with a moderate to brisk south-westerly wind.